For nearly the past year I’ve been watching my 14-year old son play the console video game, Red Dead Redemption. I am not twitchy enough myself to survive more than 4 minutes at the controller, but I find I can spend an hour just watching the big screen as my son rides through frontier towns in pursuit of his quests. It’s sort of its own movie. One never knows what will happen or how things will play out in a world rendered with the same degree of fidelity as a Hollywood blockbuster. 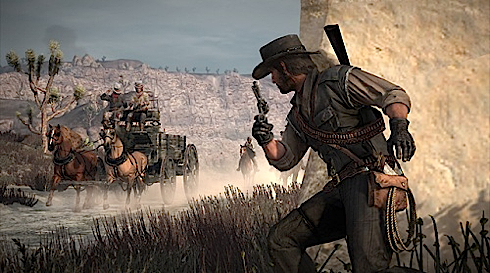 Red Dead Redemption comes from Rockstar, the company that made Grand Theft Auto, and like that earlier game, it does not restrict the movements of the player very much. In GTA, the player can drive anywhere, at least in the grid of streets. 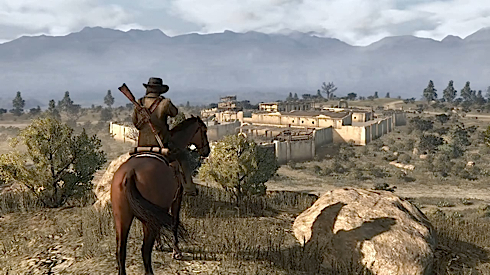 In the new game Red Dead Redemption, there are few roads; instead the player can ride or walk through the open space of a western range almost with no prohibitions at all. Eventually your actions are channeled funnel-like to meet the next bottleneck of the overall narrative, so the game does have a destiny, but your choices still matter in what kind of points you accumulate. When the perception between the ordained and free-will is tweaked just right, it gives the game great “play” — moving the narrative forward while letting the play steer. In RDR the wide open landscape, without streets, seems to offer so much free-will to the player that it is shocking at first. At every step you can turn in every direction to take the next step, and yet the grass, thorns, brush, sand — every plant or rock at each step along your way — is rendered in exquisite detail, casting perfect shadows, and even darkening in appropriate wet splotches when rain blows in. And mist and snow do come in, and night and dawn come and go, shifting the tint of the place in tune with the clock or weather. The overall impression I have is of being immersed in a complete world, with total freedom, painted with a realism that is greater than Second Life, or any headmounted 3D VR system I’ve tried. You want the player to feel almost torn between ‘Do I go and do the structured thing or do I go and not do the structured thing?’ From a design standpoint … the challenge is not making the game too complex and letting the player know what’s there in an easy and non completely invasive way so they feel they’ve got complete freedom of choice over what they’re doing, but still over time you want them to move through the story because that will move them through the world. Better yet, here is a movie where there are challenges, things to accomplish, and motivations to reach the end – wherever that may be. RDR takes the familiar quests of role playing games, and the familiar skills and thrills of first person shooters, and the familiar gritty verisimilitude of environments enabled by video cards in console games, but opens up the possibility space to a unexpected degree, so it seems liberating in some way. I say all this as an observer. Dedicated players can probably add more. There are of course related games like Uncharted 2, and the latest Call of Duty, and they are powerful, but I detect more of the future hidden in Red Dead Redemption. An fully rendered, immaculately detailed, stunningly interactive world, stretching to the horizons, in which you are apparently free to roam and find adventures in. I think we’ll see more of this. This morning my 7 year old son ran to the PC to check Youtube for cheats for his latest console game, Lego Star Wars III. I told him that he should not cheat as it spoils the fun. His answer was: I will stop cheating if they stop making the cheating videos. The redefining of values has started. Yes, it may be the future of mainstream games. I was wondering Kevin, have you heard of Braid? It’s a game by a two man indie team, and the creator, Jonathan Blow, has many lectures and articles floating about the web. He has his own ideas about what video games should be: games that weave the meaning gained from gameplay and the storyline together, rather than just having them parallel; games that reward creative thinking; games that work with the player rather than fight against him or her. While I like some mainstream games, the large companies generally don’t have the same insight as he does. Danny, I had not heard of Braid, but I will check it out. Another one-man indie game, Minecraft, I am aware of. Whole ‘nother thing and game play. I’m looking forward to non-violent immersive free-range games. It seems like something that could be a fun indoor activity with my 5yo daughter. Especially as a way to get a city girl more interested in long outdoor hikes, ironically. No PC version for RDR though and with consoles mostly filled with kids on the PS3 and Xbox and really young kids and really old people on the Wii, I will stick with my PC, thank you which has 1000’s of games on places like Steam that are far cheaper than the console’s 40-50 premium. while letting the play steer.” That’s a great metaphor for education as well.